I am entering this one into the Taylored Expressions Sketch Challenge #102 and the High Hopes Challenge 65 - Orange Brown plus circle. The card base is PTI Summer Sunrise. The blue (SU Bashful Blue) was embossed with my Cuttlebug. I turned the TE Sketch on its side so that it would work with the big image. 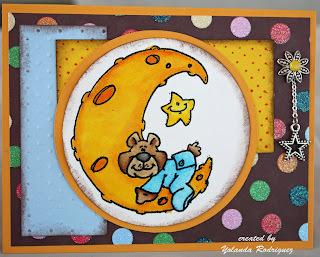 The stamp is High Hopes Bedtime Bear embossed on Watercolor Paper and colored with Twinkling H2Os. The spacer and star charm are from Stamp and Create. Great card Yolanda!! Love your colouring & nice layout too!! Beautiful colouring, love the glitter paper too. Thanks for joining us for the High Hopes Challenge. This is adorable! Thanks for playing the High Hopes challenge! I love your card Yolanda, beautiful colouring and love the polka dot glitter, Hope you can play again!